Tiny homes fascinate me. I see those articles on Yahoo about people living in 100 sq ft or something like that and I’m hooked. I have to read it and look at the pictures of how they fit their whole lives into a space smaller than my bedroom. I don’t live in a tiny house. I live in a big old rambling Victorian and wouldn’t give it up for the world but the idea of these tiny houses is just fascinating. 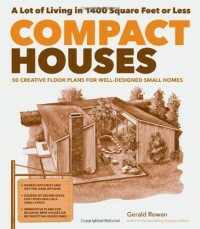 If I did want a compact house for some reason, I would start with this book. Compact Homes is a great introduction to these homes. Some the houses in this book are not that tiny. Many are several hundred feet, up to 1400 but they are still small by the standards of a lot of us and they are meant to be small and efficient. I really enjoy seeing how smart the utilization of space is. I love seeing all the ways the authors find to create storage spaces in homes. This book has quite a few floorplans, about 50 I think. I get a kick out of looking these over. But this book goes far beyond just floorplans. There are chapters on each room in the house and how to get maximum use out of a few feet. It brings Japanese design into a lot of their idea because the Japanese use their floor spaced so efficiently. It talks about space saving appliances and even talks about the sink-toilet combo which grosses me out just from the name of it. There is a discussion of Usonion design¸ a word I had never heard before. It’s really interesting and explains how the neighborhoods a lot of Americans grew up in came about. There are plenty of suggestions on how to get the proper furniture for such small spaces and how to make the furniture multi-functional. There are plenty of illustrations of their ideas. Some are quite remarkable. Again, this is all just fascinating to me because it looks like someone living in miniature. There are good sections on trying to be sustainable and energy-efficient. Heating and cooling methods are discussed and how to customize a small home for yourself or renovate an already built small home to make it more efficient and comfortable. I really enjoyed going through this book. I’ll never be able to live this way. My husband and my son are 6’4” and not super-skinny. (They are not fat, just normal size for 6’4” guys.) They would feel like giants in the houses this book shows. We have kids and grandkids and family and friends that come regularly and we throw pretty big parties so we can never live this way and I’m quite claustrophobic so there’s that also. It still is fascinating and intriguing for me to imagine what life in a compact house is like. This book gives a great feel for it. Provided by Netgalley in exchange for an honest review.